Bugsy Siegel | STEP BEHIND MY SCREEN OF STORIES. The inner voice where gaps of expression are liberated. When I was eleven years old our home burnt to the ground in the Bel Air fire, and everything we owned fell to ash. Shortly after my mother moved us to an apartment in Brentwood, a mammoth carton arrived and was placed in the center of the living room. My mother cut it open and urged me to look inside. I sat cross-legged on the avocado green carpeting and discovered bundles of garments; Bermuda shorts, blouses, sweaters, and shirts. I quickly shed my worn trousers and stepped into a new outfit, dancing about as I zipped myself in. My mother watched, and echoed my childish yelps of elation. Years later, my father, Allen Smiley, called and told me to come over to his apartment in Hollywood. I’d learned Millicent was Benjamin Siegel’s daughter, and Ben was my father’s best friend. Dad was sitting on the same chintz covered sofa the night Ben was murdered. When my father answered the door, I watched as they embraced. Millicent had tears in her eyes. She walked over to me, and took my hand. I looked into her swimming pool blue eyes and felt as if I was drowning. She sat on the edge of the sofa and lit a long brown Sherman cigarette. I studied her frosted white nails, the way she crossed her legs at the ankles, her platinum blonde hair, and the way her bangs draped over one eye. What impressed me most was her voice; like a child’s whisper, her tone was delicate as a rose petal. I spent the rest of that afternoon memorizing her behavior. She emanated composure and a reserve that distanced her from uninvited intrusion. Over the next few years, Millicent and I were joined through my father’s arrangements, but I was never alone with her. When he died in 1982, she was one of only three friends at his memorial service. As the years passed, and my tattered address books were replaced with new ones, I lost Millicent’s phone number. I had been researching my father’s life in organized crime, and had gained an understanding of my father’s bond with Ben Siegel. My discoveries were adapted into a memoir and recently into a film script about growing up with gangsters. During this time, I had reconnected with several of Dad’s inner-circle, but Millicent was underground, and now I understood why. Last year I received an email from Cynthia Duncan, Meyer Lansky’s step-granddaughter. She told me about Jay Bloom, the man behind the Las Vegas Mob Experience, a state of the art museum that will take visitors into the personal histories of Las Vegas gangsters. Cynthia contributed her significant collection of Meyer Lansky memorabilia, and assured me Jay was paying tribute to the historical narrative of these men by using relatives rather than government and media sources. She wanted me to be involved. A month later I was seated in Jay’s office waiting for Millicent. When she walked in, I stood to embrace her, and this time the tears were in my eyes. Jay took me on a tour of the collection warehouse, and the history I’d read about unfolded before my eyes. The preview room was like a family room to me, because some of the men had been my father’s lifelong friends and protectors. I stopped in front of the Ben Siegel display case and saw an object that was very familiar. “My father has the identical ivory figurine of an Asian woman. I still have it.” So much of their veiled history was exposed; between these two men was a brotherly bond that transcended their passing and was even evident in their shared taste in furnishings. After I returned home, Millicent and I talked on the phone. “My father hated Mickey,” I said. 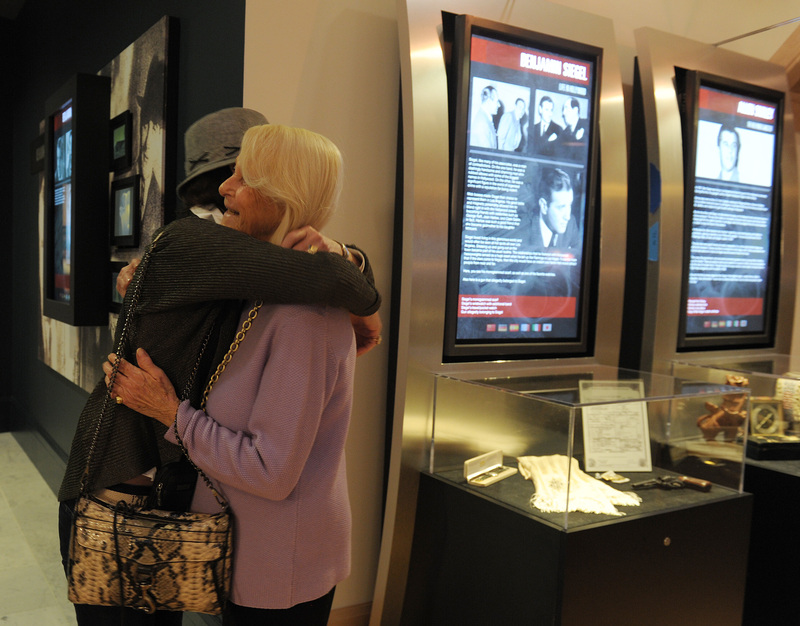 Reuniting with Millicent at the Mob Experience. Still A Mystery…Who Shot Benjamin Siegel. Several months ago I received an email from a reporter in Las Vegas. George Knapp had read some of my memoir posted on my website, and asked for an exclusive interview. He asked about my father’s relationship with Ben Siegel “Bugsy” and what I knew about their friendship, and why Ben Siegel was shot. I declined the interview, but George persevered. Three weeks later I agreed to the interview, because my father was not there to stop me. We met in Del Mar at the Inn Auberge. I showed up with a notepad to remind me what not to say, a photograph of my father when he was a producer for Cecil B. De Mille, and a borrowed calmness that comes when I am approaching an extremely anxious situation. My first interview about Dad was not anything like I imagined. George approached the subject with respect, and I relaxed and began talking, and talking, and talking. The only time I hesitated was when he asked if I knew who killed Ben, and I had to answer swiftly, “I think Bush did it.” He was not too impressed with the answer; but it saved me from theorizing. At the end of the interview, I walked out of the hotel without regret. I said what I felt should be told; that my father’s best friend was Ben Siegel. If he loved Ben and my mother loved Ben, than there is a lot more to “Bugsy” than what the public has been told. The interview aired on a Friday night, and my life was no different from before. George got a call from someone who claimed my father once told him, Virginia Hill’s brother was the shooter. It sounds like my father; he enjoyed sending people down the wrong path. He always said, “You don’t inherit friends,” and so I declined to remain friends with family members of his group, because I respected his orders, even after he died. I don’t know if any of his mob friends are still alive today. Many people claim they knew my father, but in essence, what they mean is they met at Ciro’s, or had a game of cards, or went to the racetrack. My father’s only friends were connected to organized crime. I learned this when he died; three people showed up for the service. He warned me to keep away from reporters, and not to trust anyone. Still, strange incidents followed his death that I was unprepared to handle. A man I’d never heard of called and informed me, ‘ your Dad and Ben buried a safe deposit box in downtown Los Angeles. ‘You should look for the key, there may be a lot of cash.’ My father was not about to leave this world without telling me he had stashed money in a safe deposit box. I will bet every dollar on that. Another man, posing as a friend, came to my aid offering help settling the estate. A few weeks later another man I had never heard of, placed a claim on the estate for an old gambling debt of $5,000. The two of them were conspiring. Had I known gambling debts are erased when the bettor dies, I would not have sold his Patek Philippe pocket watch, which I suspect belonged to Ben Siegel at one time. The end of my father’s life was as mysterious as when he was living. That is how he liked it, and that is how he lived it. I had to wait until my father was in his seventies to go to the racetrack with him. He took me to Santa Anita, we sat in the clubhouse, and he watched the track from behind dark glasses. He was quiet and observant. He watched me eat, and then handed me a C note to bet on the Exacta. He told me how to bet and which horses to bet. I walked away from the cashier thinking I would be a big winner. Instead, I walked away a big loser. ‘Now you know even your Dad loses at the track.’ There wasn’t anything exciting about going to the track, he made sure of that. I suppose he was concerned, that I had inherited a taste for betting. Lucky for me; I throw the dice on a different game. 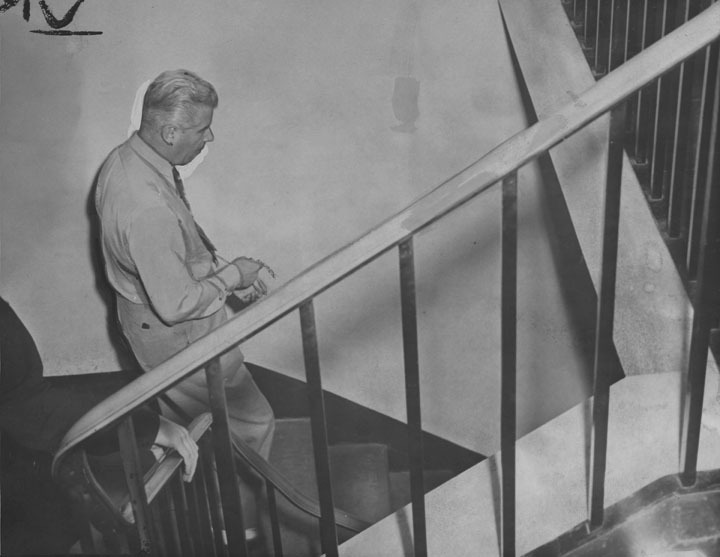 Photo: Leaving Beverly Hills Police Department day after the murder. Screenplay based on a true story. Luellen (Lily) is the daughter of Allen Smiley, Benjamin “Bugsy” Siegel’s best friend, and business partner. Smiley, seated next to Bugsy the night of his murder, marked by historians and the media as the set-up man. Lily rips herself from comfort and innocence into confronting her father’s nefarious criminal life. When she breaks the mafia code of silence ten years after her father’s death; she faces an unexpected opponent. Does this procure your interest? If I had known that I was seated next to the Mafia Boss of Los Angeles, then I would have listened with sharpened ears, and repeated bits of explosive headline blood curdling stories to my girlfriends. That would have placed myself, my father and my friends in jeopardy. An informant from the government may tag me on the way home from school, or tag one of my friends, or an enemy of the Boss, may pick me up from school and not bring me back. Everyone is suspect: an informant, or weak enough to become an informant, a loose lipped wise guy, a bragging connected businessman, a friend of a friend, a cousin of a brother, and a daughter of a gangster. We are all potential targets of this organization known as the Mafia, Mob, syndicate, Costa Nostra, or our thing. Growing up in this circle of gamblers, killers, fixers, enforcers, bookies was like growing up in a novel, it was a fictional tale all the way, until the end of my father’s life. There is a drop down board that appears every time I write about our family business that reads, “ How dare you open my life to the world, what do you know? You know nothing little sweetheart, and that’s the way I planned it. “ “There’s no such thing as the Mafia! If you ever mention that word again, you’re leaving this house!” I melted down to the floor, and he was ominous as God standing over me. I would never mention the word again, I promised, and I would never believe in the Mafia. So, I became a writer of our secret interior life. I am a diarist. I record life around me so I can understand, as if by understanding I will find peace. Recording the exaggerated emotion and incidents of life began as a young girl when my mother gave me a diary. A good storyteller has to live life differently than the rest of us; otherwise, the stories will be predictable. My father had those kinds of stories. 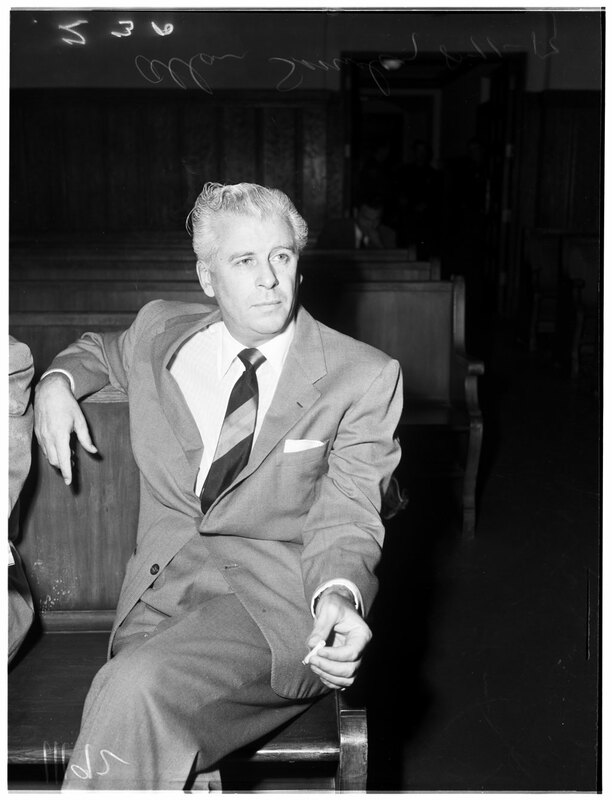 Allen Smiley: Illegal immigrant, Russian Jew, convicted criminal, hoodlum, extortionist, con-man, racketeer, bookmaker, tout, pimp, and high-ranking lieutenant and best friend of Benjamin “Bugsy” Siegel. “Just come down here and get me. The phone call had woken me up. It was the first of several that night. I sat up in bed and looked at the clock. It was past midnight. Why was he up so late? I called the hospital and asked to speak to the head nurse. I told her about the phone call. She said he was hallucinating, and that he’d refused medication. That was the first time I had ever sensed desperation in my father. He was afraid they were coming to get him. Who were they? Several days later the phone calls stopped. He died as secretly as he had lived. There was an absence of publicity or concern. I knew what to do. He had given me instructions. I was to go to the bank, draw out what money was in the account, and go on a vacation. I took his phone book, the photograph of Benjamin Siegel, and one of his baseball caps. I packed up his black El Dorado Cadillac, and shot out of Los Angeles. It was the final scene of the first half of my life. I drove south on 405 hwy down to Del Mar. There was nothing waiting for me in Del Mar; no friends, or job, or anything to connect to. I only knew that when my feet touched the Del mar beach, I had to move there. That summer I went to the Del mar Race Track and sat in the bleachers just like anyone else, wearing a hat, drinking Long Island Iced Tea and trying to see with the blinding sun in my eyes. It was strange to sit with the general public. The few times my dad took me to Santa Anita we sat in the Turf Club. I had no idea my father was part of the historical narrative of Del Mar race Track, and of Del Mar history. After living in San Diego more than ten years, I returned to Los Angeles for a job offer. One afternoon I visited my father’s walking path along Ocean Park in Santa Monica. He walked from one end of path to the other beginning at San Vicente and ending in Venice. Afterwards we’d stop at the Lobster House for a plate of fish and chips, and a cold beer. While I was walking in his memory, imagining him next to me, I looked up and recognized one of his walking pals, Sonny Barry. He looked like a retired Vegas dealer; dark shades, v necked open shirt, and Beverly Hills signatory gold chain with a Star of David. ‘Hi Sonny, how are you?” I called out. “Luellen, you know Sandy Adler, he was friends with your Dad a long time ago. Sandy Adler, my father had mentioned his name, but I didn’t know how they met or when. He was another man that fit into the mysterious and unspoken years he was partner with Ben. It was the mention of my mother, who died when I was thirteen that pierced my antenna of interest. Sonny stood back while Sandy took my hand, and said let’s take a walk. We walked along the bluffs overlooking the pacific ocean. He spoke slowly, and paced himself as if the memories were lodged in books and he had to dig into them. I couldn’t utter a word I just listened. 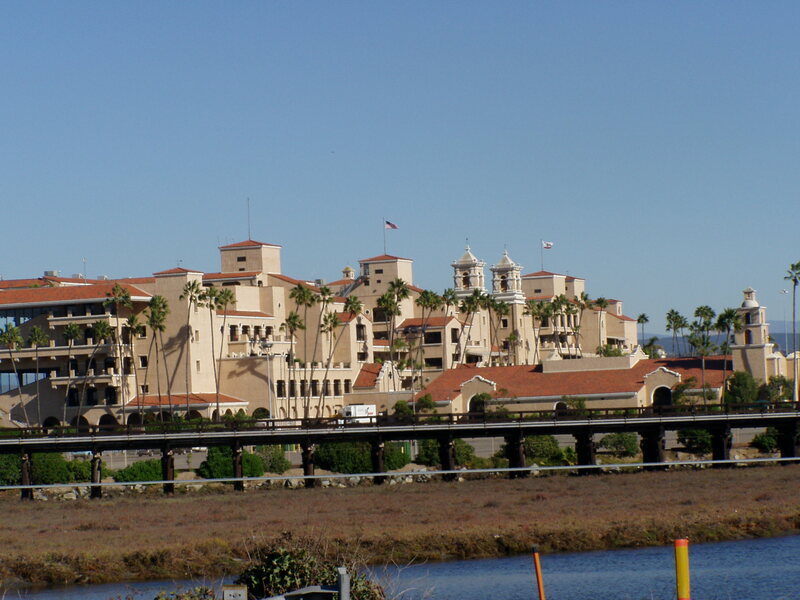 The Del Mar Hotel had burnt down before I moved there. I’d seen photographs of the hotel, and heard stories about the Hollywood stars that stayed there. It was a magical legend in Del Mar, everyone who lived during its glory days talked about it. It was sometime after that, that I walked in the sand where the hotel had been located. I understood that one day I would begin plucking away at my family history. This is an excerpt from the memoir I’ve been working on many years. The first manuscript was 800 pages; about three of them were worth reading. The book mutated about 2000 times. “That’s the book, let me look first and see what it says.” She whispered. I waited while she flipped trough the pages. “Oh my God, there he is,” she said grasping my shoulders. We hunched over the book and read the description of my father beneath his photograph. “What does that mean, who is Bugsy Siegel?” I asked. I don’t think I should read this, “I said replacing the book on the rack. “Don’t tell your father I told you,” she warned. My father called himself Allen Smiley. The FBI tagged him “armed and dangerous.” The Department of Justice referred to him as the “Russian Jew.” I called him Daddy. e had salty sea blue eyes blurred by all the storms he’d seen. When I said something funny, his eyes crystallized and flattened like glass, smoothing out the bad memories. He was always a different color, dressed in perfectly matched shades of pink, silver and blue. My small child eyes rested cheerfully on his silk ties, a collage of jewel tones. The feel of his fabric was soft like blankets. He was very interesting to look at when I was a child and open to all this detail.